Coffee is one of the best things you can get in Astoria, and there certainly isn't a shortage of it, especially on 30th Avenue. We took a stroll down the avenue last weekend and stopped at Athens Cafe for strong Nescafe and Frappes - both enjoyable and of great quality. 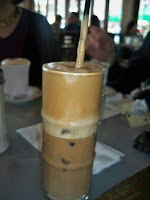 Frappe - A signature coffee drink in Astoria, it comes in a tall bamboo shaped glass with coffee foam on top. I think the foam is its best feature, and it's almost as strong as the coffee. Sipping this drink is an experience and I suggest that you go slow, unless you want all the caffeine to hit you at once--not recommended. This drink is wonderful to get on a really hot day when all you want to do is cool off and relax. Nescafe - The hot version of the frappe, it's more comforting. 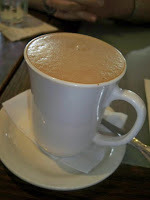 Nice and strong, it had great foam on top and the beauty of it is that it came sweetened. Not 100% sure about this but I think that they sweeten it with simple syrup instead of sugar, as there was no excess on the bottom--it was all perfectly blended. Our waiter was wonderful. For a big group of eight, he was patient with us and explained the differences between the many coffee options. He made strong recommendations and really knew what he was talking about. With so many variations on the coffee menu, he put things in perspective and was able to help us narrow down some choices. The costs are on the expensive side with certain specialty coffee drinks costing up to $8.50. I couldn't believe that they would actually charge nearly $10 for a cup of coffee. Naturally, we stuck with the more economical options, both coffees that I mention above in the $4.95 range--still pricey but a good indulgence for an authentic experience.